Treating Bad Breath Via Tongue Cleaning – It’s the most simplest and most important step you need to start with when you have constant breath problem. This post will explain why it is important and how to clean the tongue properly. So stick around if you want some essential tongue cleaning tips! Many journals have been written discussing the part the tongue plays in obtaining a healthier fresh mouth. A study in 1998 looked at subjects with malodour and discovered 87% of them had a problem with their mouth hygiene. Of the 87%, 51% of the cases were due to a dirty tongue, 32% due to gum disease and 17% from a combination of both. The statistics above conclude that in 68% of cases, deep cleaning of the tongue should have a major affect or even cure a persons bad breath. This is backed up by older studies carried out in the 1970’s which also concluded that tongue cleaning reduced malodour by upto 59-87%. If you have a keen interest in the science behind all of this, then feel free to read the full journal which can be found at PubMed. When you brush or scrape the top side of your tongue (Dorsal surface), you are actually getting rid of the largest population of odour causing bacteria and the food debris that they feed on. Researchers have hinted that the food debris is what makes the odour worse. In some ways they are right because if there was no food debris present in our mouth then those bacteria would have no food and eventually die out. If you have ever done a breath test you probably noticed the back part of the tongue smells alot worse than the front tip part. If you Don’t know how to test for your own breath then please read my post on Best Ways To Get Rid Of Bad Breath. This is because the tongue is used for speaking and swallowing which places it in direct contact with your hard palate. Friction from this causes a cleaning action which stops bacteria and food building up and sticking. This is because the back part of the tongue only touches the soft palate and the contact is pretty minimal and gentle. this is not enough to dislodge bacteria and any food particles, eventually leading to unwanted build up. This is why cleaning the tongue can have a massive impact in curing bad breath. You can easily see the state of your tongue in the mirror. If there is a brown or white covering present you know it needs cleaning. Most of the odour causing bacteria and food debris is located in the back portion of your tongue so make a conscious effort to focus in on this. 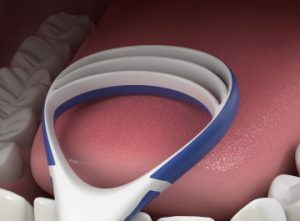 Don’t go and start brushing or scraping right at the back where your tonsils are, it’s pointless. I found that when i started brushing my tongue, my gag reflexes kicked in and i nearly threw up. I still brush my tongue every now and again but it’s really hard to do it for a long time, i stop after about 20 seconds because it gets too much and my eyes start watering. So instead of brushing i use a scraper now, it does not give me the gagging feeling and i can actually see the gunk that comes off my tongue. The first time i used it loads of gunk was on the scraper and i decided to see how it smelled. IT WAS AWFUL! Let me tell you something, that day i felt like a million bucks because i knew that my mouth was clean and fresh and ever since i have been doing this regularly and hardly have any crap on my tongue when i scrape it. For me once a day is enough. The picture above is what i use and is called a dentafloss, it’s a 3 in one tool. I use it to floss my teeth and then scrape my tongue. It works fine but it’s far from perfect. the one thing i really hate about it is it’s not comfortable as there is no proper handle to get a grip. After a while my hand starts to ache. I suppose it gets the job done but there are better options available that i will be sharing with you later on. Be gentle when scraping as rubbing too hard will cause irritation or even bleeding. Start with low force and gradually work your way up to the point where you can see the thin film coming off the tongue. This is your sweet spot. It really depends on how much of a breath problem you have. If you don’t notice any odour and your general oral hygiene is good then once a day will suffice. In cases where a cure is necessary, it has been researched by many different scientists that tongue cleaning twice a day could be a possible cure. I would say start off by cleaning the tongue once a day to start with and eventually you will start to see the benefits and you will subconsciously start doing it every time you brush your teeth. That’s exactly what happened to me. 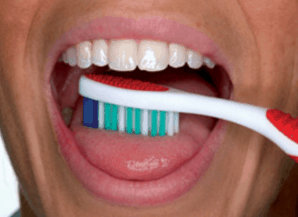 Tongue brushing Vs Scraping – Whats Best? 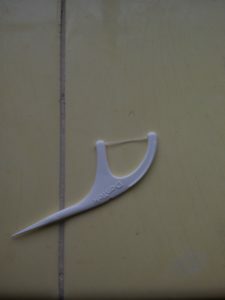 There are various studies which have suggested that tongue scrapers and cleaners showed a slight advantage over a regular toothbrush. You can just use your regular brush for this and if you start to see results and it is comfortable you can then go and start looking for more speciality brushes which will do a better job. Once cleaned, rinse your mouth out as well as the brush with warm water. Cleaners – tongue cleaners are a hybrid between a brush and a scraper. They contain: rubber bristles that help to get into those grooves and furrow on your tongue. they also have a blade part which you can use to scrape the tongues surface. I reckon tongue cleaners are slightly ahead of the other 2 products when it comes effectiveness, but it is all about your personal preference. You can shop around for any of the mentioned products and there is definitely no shortage of designs to choose from. turn the spoon upside down and start from the back and scrape forwards making sure to use enough pressure to break up the debris. The spoons are one of the most efficient ways to clean your tongue but the only thing is, it is used for eating. I just feel like the spoon has become dirty and is filled with bacteria, this makes me feel uncomfortable using any spoon even if it’s brand new. I might sound a bit OCD but im sure other people out there feel the same way. The scraper that i would recommend is the Orawellness Tongue scraper which can be found on the orawellness main page. The main selling points of this is the two handed grip which does not put undue stress on your wrists. It’s also made of stainless steel making it impervious to bacteria and is more comfortable and gentler than plastic. I think that’s all i have to say on this subject. The main takeaway from this article is you must scrape off the dirt from your tongue if you want to get fresh breath instantly. whatever tool you decide to use please make it into an everyday habit and you will be much happier. I remember ever since I was a young child that someone told me the importance of brushing your tongue as well as your teeth. It has a huge positive effect on your breath and there are many people I would advise to do it;). I’ve seen that product you’ve recommended and it is really good at doing the job. I might have to buy that for myself! Hi Josh, thanks for your input. I was quite the opposite, i never heard anyone mention anything about cleaning your tongue not even my dentist. i didn’t know this was even a thing. But good gosh when i found about this subject and tried it for the first time, my tongue was much cleaner and my breath did not smell at all. I’m hooked now and do this everyday. I like to use a scraper just because i can see all the crap coming off of my tongue. the product i mentioned is also a scraper and it works like magic, only takes about a minute to do and i’m all done. Highly recommend it. Your review of using various methods and tools to clean the tongue is unbiased and marvelous. Usually, we never give much importance to tongue cleaning. Your article clearly teaches the importance and ways of cleaning the mouth to eliminate the bad breath. I never Knew that there are so many ways to clean the tongue. I have one question. Is tongue Cleaners are superior to Orawellnes tongue scrapper? Thanks for your valuable article. I agree with you when you said no one thinks about tongue cleaning. People dont even brush their teeth for the recommended 2 minutes, forget the tongue cleaning. But honestly taking the time to clean your mouth properly and especially your tongue will make a massive difference. Coming to your question, I mentioned in the article that tongue cleaners will have a slight advantage over scrapers and toothbrushes simply because tongue cleaners are a mix between the two. But i prefer the orawellness scrapers because i can get a better grip and scrape the tongue evenly. the other thing is, i actually enjoy seeing the gunk that comes off my tongue and scrapers are the only device that will do that. But ultimately it’s upto you what you would like to use. All of them work fine and will get the job done, don’t worry too much about getting the right product, just start cleaning your tongue every day. This is really interesting information and honestly I did not have a clue about it. My wife sometimes say that I have a bad breath but I did not know it came from the tongue. I have always brushed my teeth and used dental floss and sometimes mouth wash but clearly this is not enough if the problem is on the tongue. I am sure going to get a scraper or tongue cleaner. Thanks for all this great information. Hi Jojo, thanks for the kind words. Everyone is focused on flossing and brushing teeth, they completely forget about the poor tongue. If you have constant bad breath, then tongue cleaning is essential. I would recommend you get a scraper as it does the job really well and is very cheap. I remember as a child being told that I should brush my tongue. It’s funny, because normally what they say 20 years ago changes as time changes and research improves, but they still say brush your tongue. I appreciate your article and the information provided. This article is well put together, and offers some very valuable points. Which toothbrush do you use? lol, i wasn’t told anything about cleaning the tongue when i was a kid. it was all about the teeth and flossing. But the tongue is an essential part of the mouth which also makes it a target for odour causing bacteria. This is why it is imperative that we all look after our tongues. Coming to your question about toothbrushes. I have the oral b 5000 electric toothbrush and it is brilliant, it does a fantastic job and is much better than the manual toothbrush i had. If you haven’t got an electric toothbrush i strongly recommend it, you will see a noticeable difference within a week guaranteed. Thanks Teeth Man, very good post here I found it verxy helpful. It made me realise that I too don´t pay much attention to my tongue even though I electric brush, floss, teepee and mouthwash twice a day. 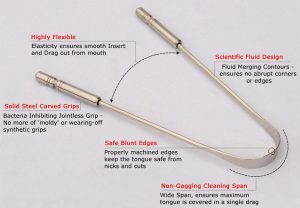 I really like the tip about using a spoon, I´m going to do that tonight for sure and then get myself a tongue scraper! Thanks again for bringing this to my awareness. Hi Nathan, i’m glad you found this article helpful and great job on your oral hygiene routine, your doing everything right. Now that you know about tongue cleaning you can complete your oral hygiene routine. Tongue cleaning will really change your mouth for the better. It will also make you feel really good about yourself. The first time i did it, i felt like a million bucks. I highly recommend you start using a scraper, it will take more of the gunk off your tongue.